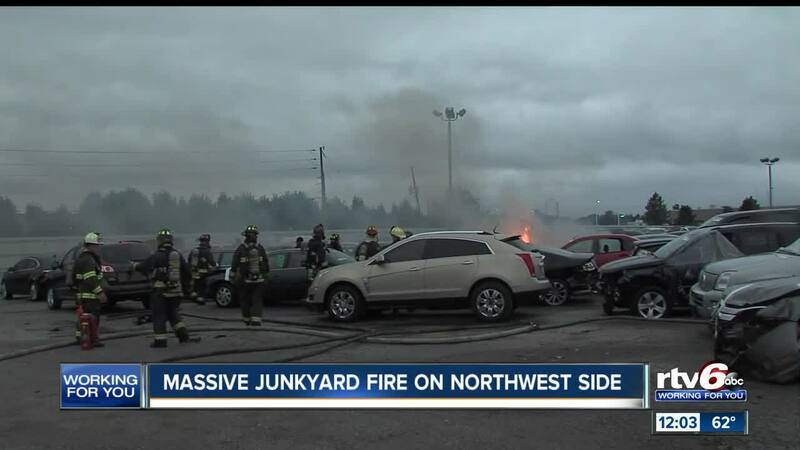 As many as 25 vehicles were involved in a large fire Wednesday morning at a salvage yard on Indianapolis' west side. INDIANAPOLIS -- As many as 25 vehicles were involved in a large fire Wednesday morning at a salvage yard on Indianapolis' west side. The fire happened at about 7 a.m., in the yard at 4040 Office Park Blvd. Firefighters had trouble getting inside the yard due to a 7,000-volt electric fence. Once inside, they used 3,000 feet of hose to access a nearby hydrant. The damage was estimated at about $25,000. The cause of the fire is still under investigation.